As a survivalist, having ammunition stockpiled for both hunting and bartering can be the difference between surviving an economic collapse, or becoming a casualty of one. 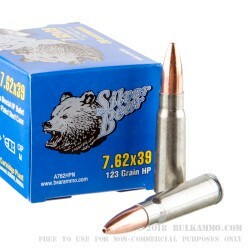 Silver Bear 123 grain 7.62x39mm Hollow Point ammunition is one of the most frequently sought after large rifle calibers here within the United States, and can provide you a solid foundation for building your own ammunition surplus at an affordable cost. With an expected shelf life of over 10 years when stored in a dry/cool climate, Silver Bear 123gr 7.62x39mm HP is great for storing away in a basement or safe for years until the day that you need it. The 123gr non-expanding copper hollow point has a max effective range out to 700 yards, and is just as devastating at close range as it is afar. 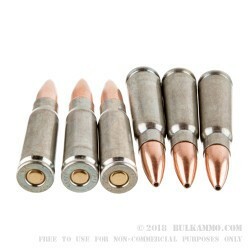 Zinc coated steel cartridges protect the integrity of the round by making them inert to most corrosive and oxidate forces, and at a price that even the most junior of survivalists can afford, this is one ammunition that you cannot afford to live without. 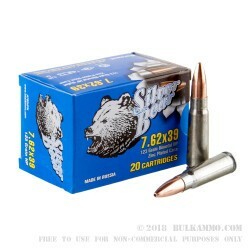 Survivalists looking for a bargain on a quality, performance ammunition will be well pleased with the Silver Bear 123gr 7.62x39mm HP. Q: Does the projectile have any steel in it, in other words, is it indoor range compliant? A: Hello Chris, This round is manufactured with a lead core, bi-metal jacketed projectile. 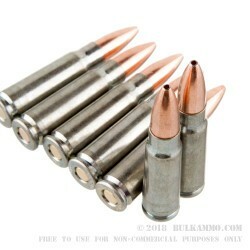 Due to the steel content in the jacket, this ammunition will not pass any type of magnet test.